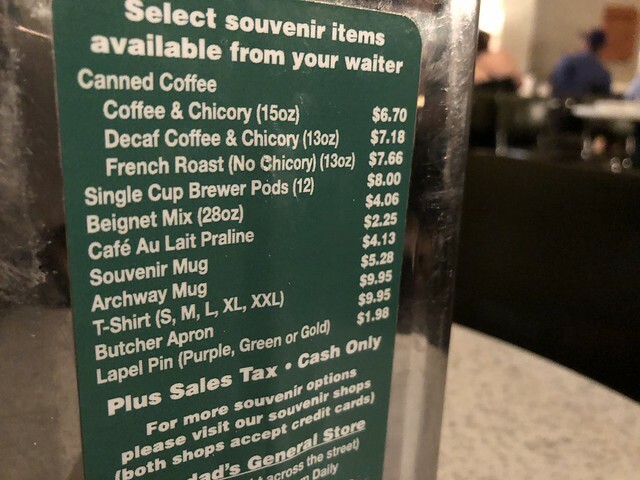 The one place you have to visit in New Orleans is Cafe du Monde. I don't really know why, but it's the most famous spot in the city, and I don't think my trip would have been complete without it. 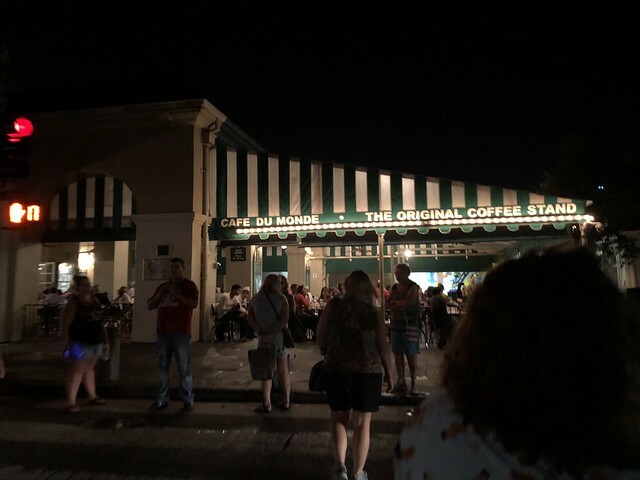 The Original Cafe Du Monde Coffee Stand was established in 1862 in the New Orleans French Market. The Cafe is open 24 hours a day, seven days a week. It closes only on Christmas Day and on the day an occasional Hurricane passes too close to New Orleans. 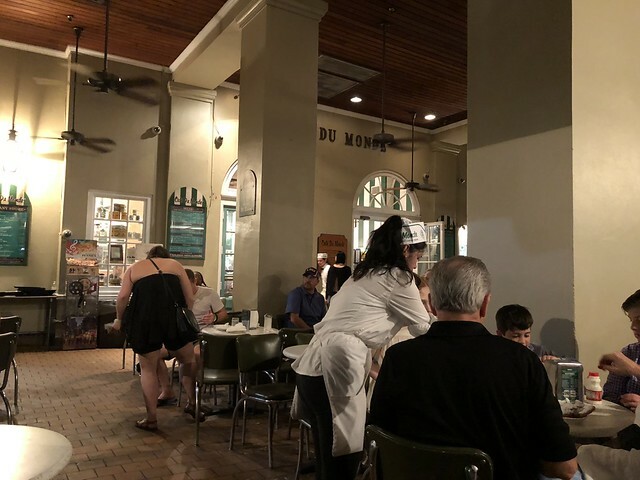 The Original Cafe Du Monde is a traditional coffee shop. 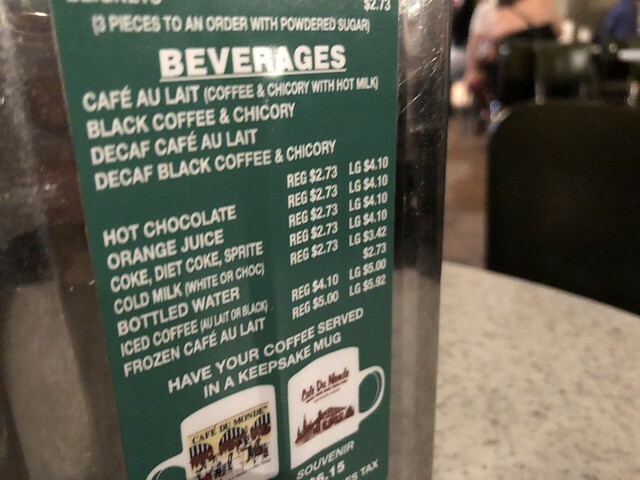 Its menu consists of dark roasted Coffee and Chicory, Beignets, White and Chocolate Milk, and fresh squeezed Orange Juice. The coffee is served Black or Au Lait. 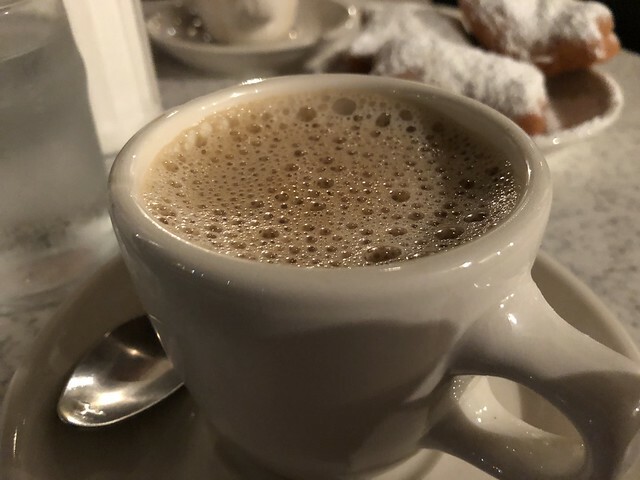 Au Lait means that it is mixed half and half with hot milk. 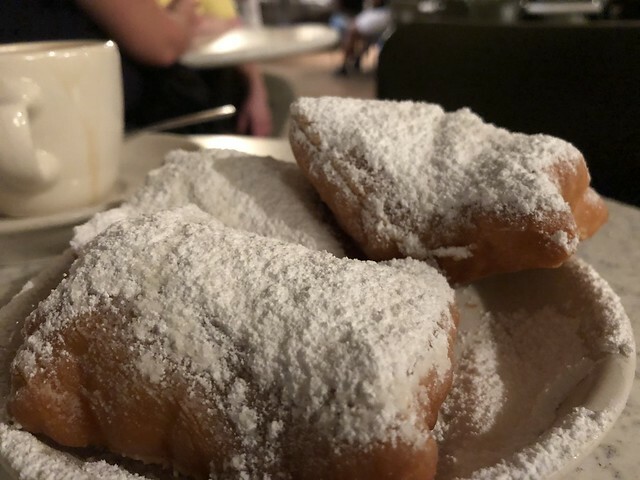 Beignets are square French -style doughnuts, lavishly covered with powdered sugar. In 1988 Iced Coffee was introduced to the cafe. Soft drinks also made their debut that year. 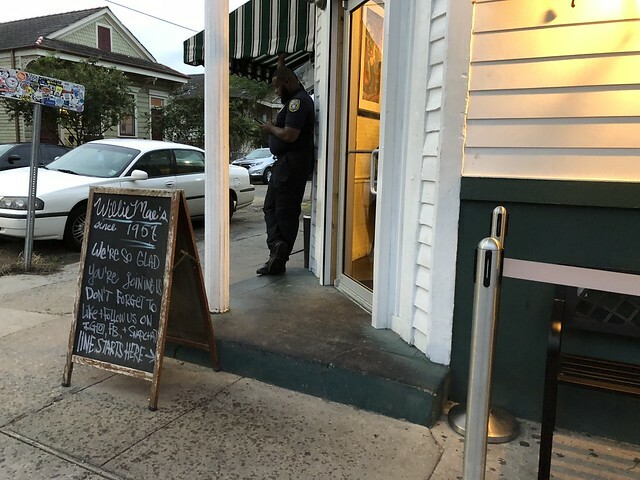 It's clear they are well trained to turn over tables as quickly as possible, as the whole experience was rushed even though there wasn't a line at 11 p.m.
We were seated and ordered cafe au lait and beignets. It came out very quickly afterward. The coffee was good and bold. The beignets were good - but I'll be honest, it's not my typical dessert. 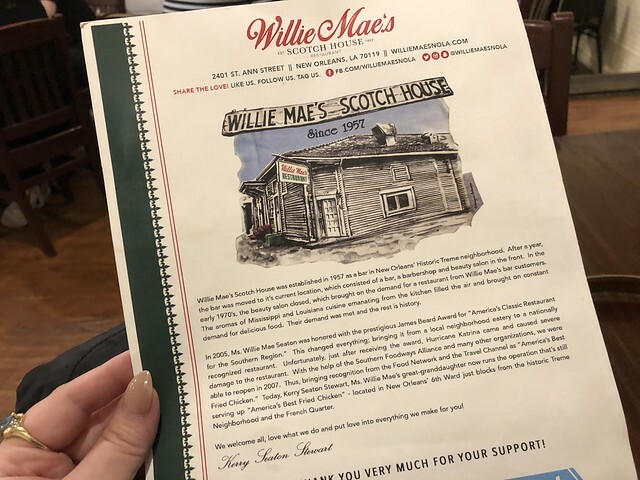 So I enjoyed it for what it was and got the experience, but pralines are more my jam. 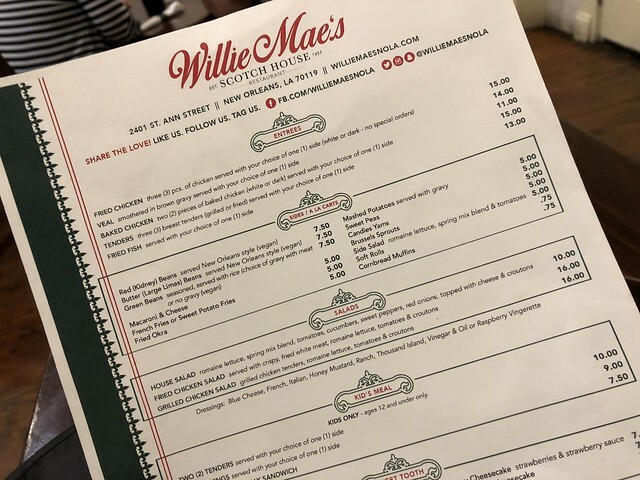 It's a bit odd, but one of the first recommendations I received when I told folks I was traveling to New Orleans was "Try Willie Mae's fried chicken!" 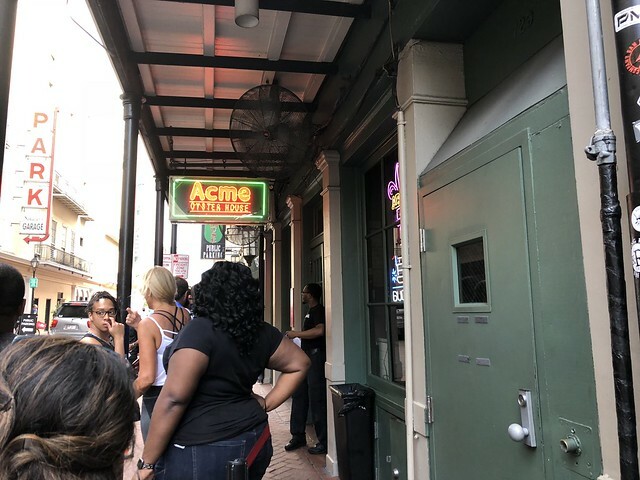 New Orleans is not typically the place I would associate with fried chicken, but I trusted the recommendations and put it on my "must visit" list. My Uber driver to get there was entertaining and called out to the police officer outside to make sure I got a seat inside right away because it was raining. Laughing, the police offer nodded and escorted me to a table - no wait! 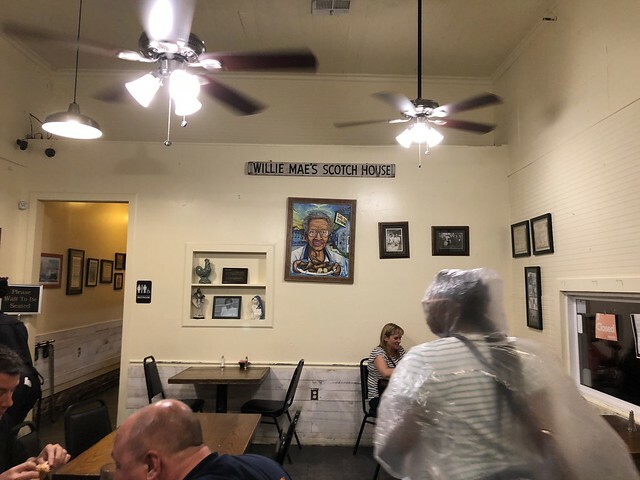 Willie Mae's is laidback, but it's clear they take what they do very seriously. 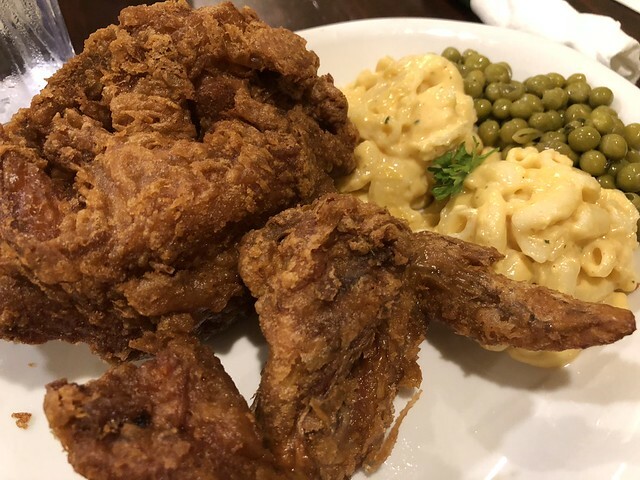 I ordered the fried chicken (white meat) with sides of macaroni & cheese and peas. And, wow, people weren't lying. It's fried chicken, done very well. Crispy chicken, moist meat - and tasty sides to top it all off! 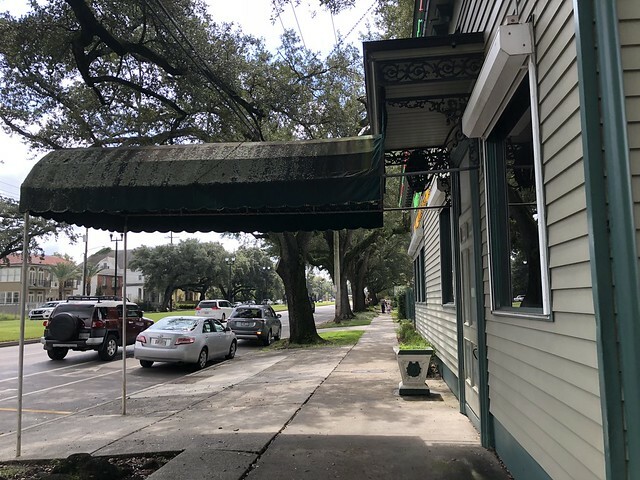 This classic New Orleans restaurant was at the top of my list. 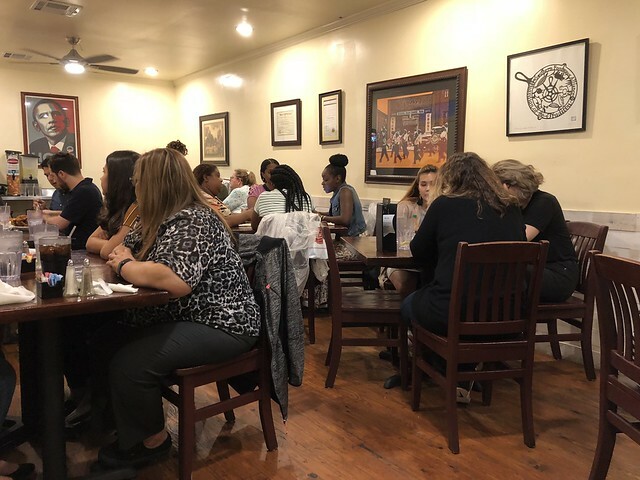 The Palace Cafe is a Drennen family restaurant - a notable group in the area - and serves contemporary cuisine. 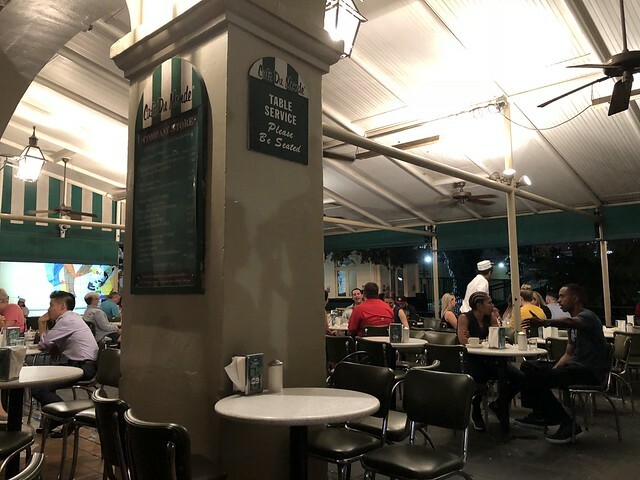 This classic New Orleans restaurant, located at the foot of the French Quarter, serves contemporary Creole food in an upbeat and lively grand café. 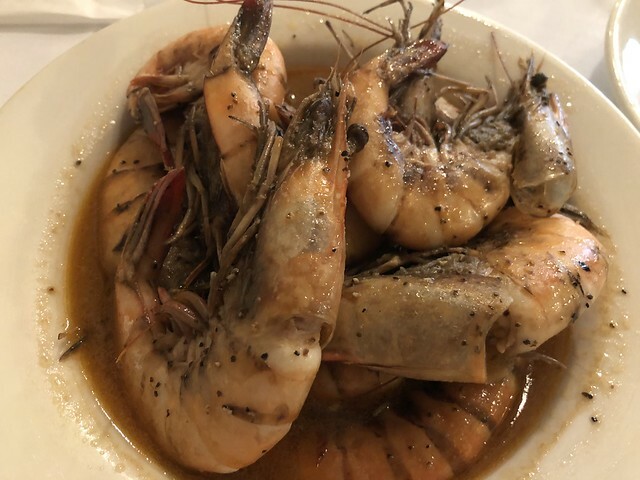 As bearers of the torch keeping Creole cuisine alive and vital, Dickie Brennan and Palace Café’s culinary team are constantly evolving traditional Creole dishes and creating a few new favorites. 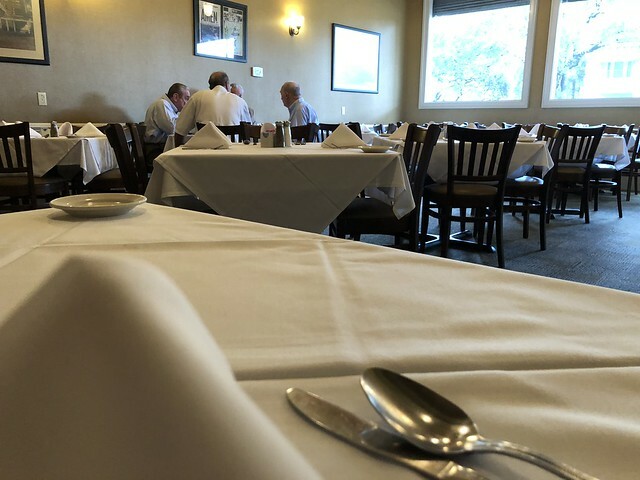 The restaurant, housed in the historic Werlein’s music building, has won a number of local and national awards since it opened in 1991 including Best New Restaurant from Esquire Magazine and USA Today, the prestigious Ivy Award from Restaurants and Institutions Magazine, and Wine Spectator’s Award of Excellence. 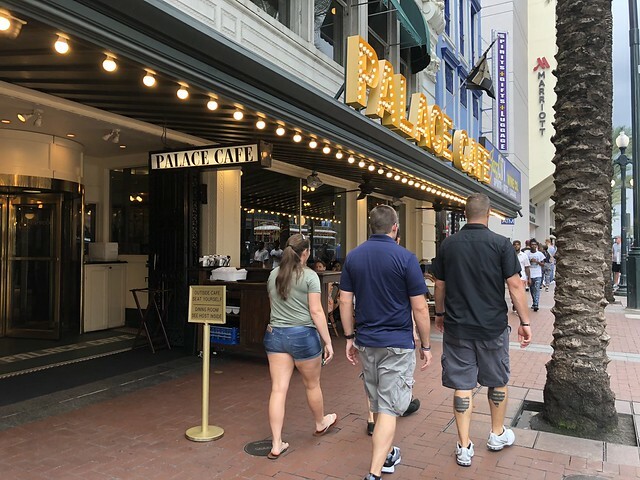 Palace Café is owned and operated by Dickie Brennan, Steve Pettus and Lauren Brennan Brower. 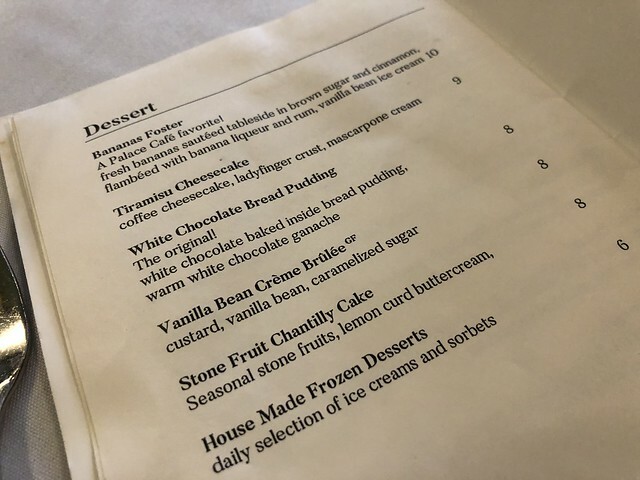 While most folks probably have a sit-down dinner here, I was mostly interested in dessert. Specifically, bread pudding. 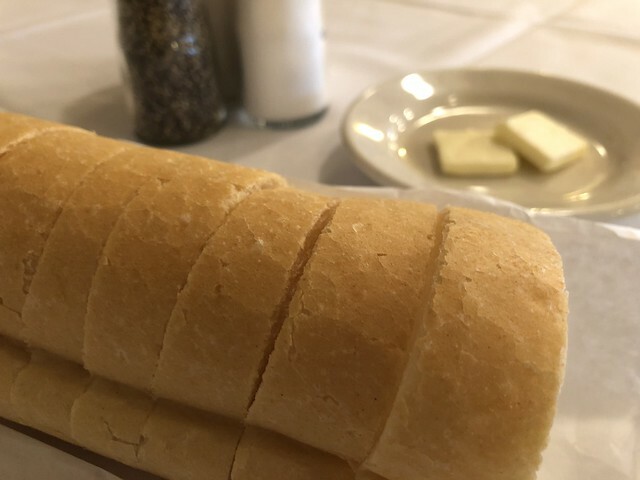 But, I still got a little loaf of bread, as is typical in the south. 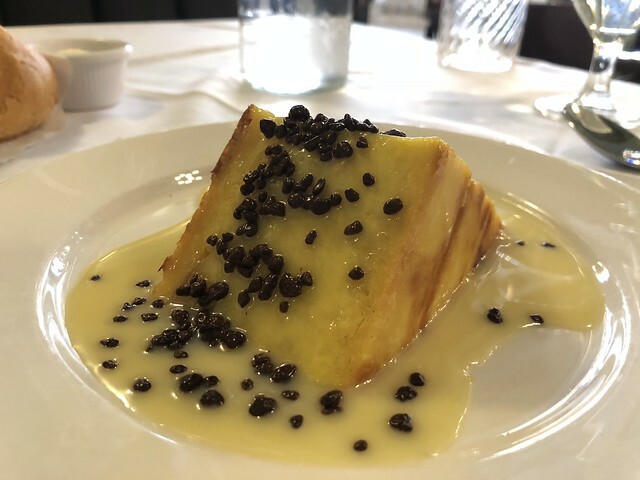 The White Chocolate Bread Pudding is basically their signature dessert, and it comes with warm white chocolate ganache. Mmmm. Just look at that little beauty! I do love me some bread pudding, and this definitely ranked up there near the top of my list. Creamy, rich, moist - divine. 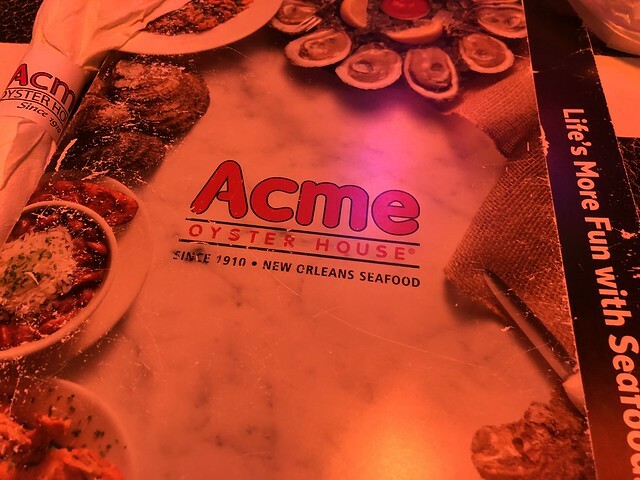 Acme Oyster House is a crowd-favorite known for their fresh oysters and seafood. 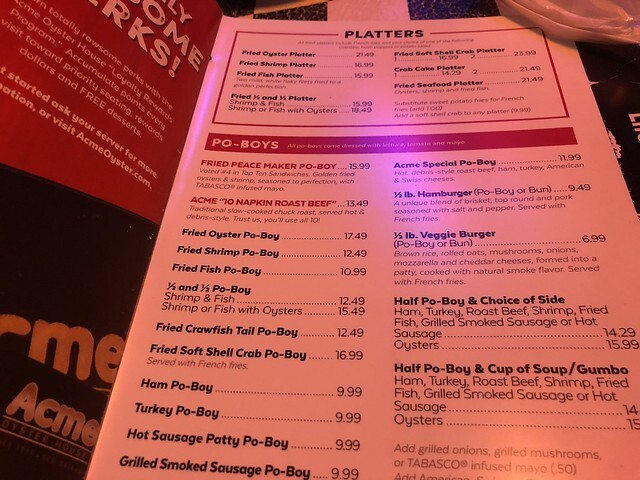 After a bit of a lengthy wait outside, I was welcome to a table - bright with red lights - to look over the menu. 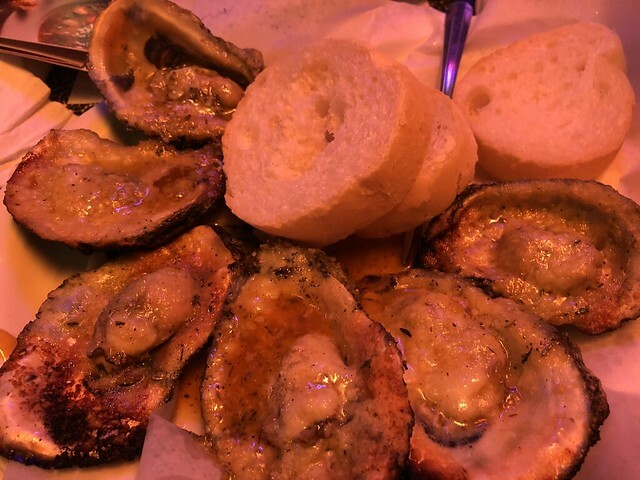 They are best known for their chargrilled oysters, which are "Sizzling, chargrilled oysters saturated in an herb butter sauce, topped with a special blend of cheese." Of course, I had to go for that! 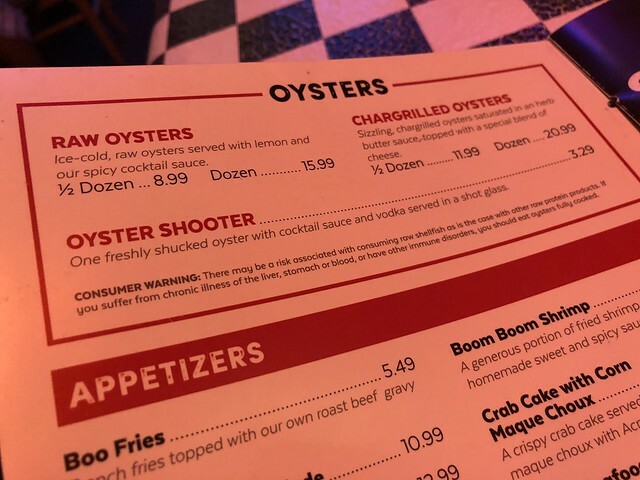 These are great - especially if you'e not keen on the slimy texture of oysters. These are indulgent, rich, and doused in butter. Yum. 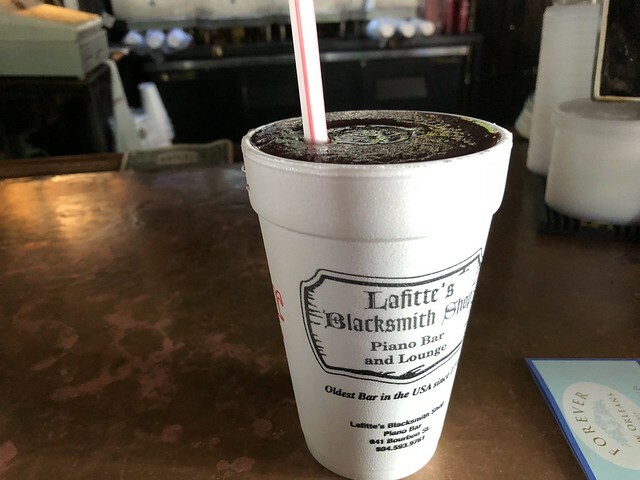 Lafitte's Blacksmith Shop is the oldest structure used as a bar in the United States - built between 1722 and 1732. The structure and fence are in the old French Provincial Louis XV or Briquette-Entre-Poteauxe style used in French Louisiana. The building escaped two great fires at the turn of the 19th Century, due to slate roofing. Such slates are presently used by artists as canvases. 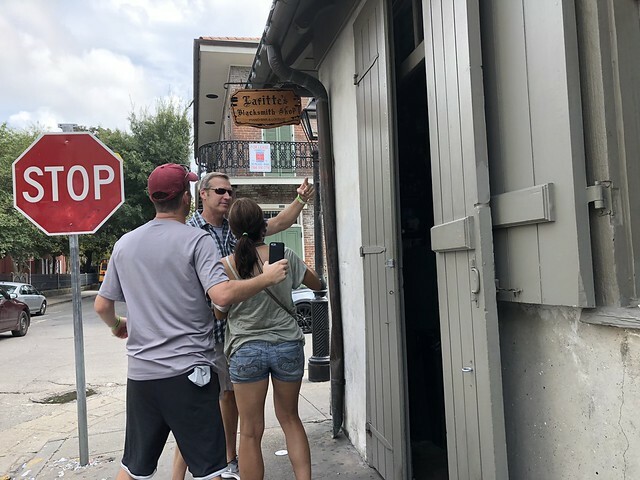 Between 1772 and 1791, the property is believed to have been used by the Lafitte Brothers, Jean and Pierre as a New Orleans base for their Barataria smuggling operation. The legend is based on the fact that the property was owned by the family of Simon Duroche a.k.a. Castillon and the wily privateer Captain Rene Beluche. Castillon was a rather record-shy adventurer and entrepreneur. Captain Beluche commanded his ship "Spy" in Lafitte's Baratarian fleet. Although the owners of the property, Jean Baptiste Dominica Joly LaPorte probably lived on the premises, it is within reason that the Lafittes could have used the place as city base for negotiations with potential buyers of their goods. 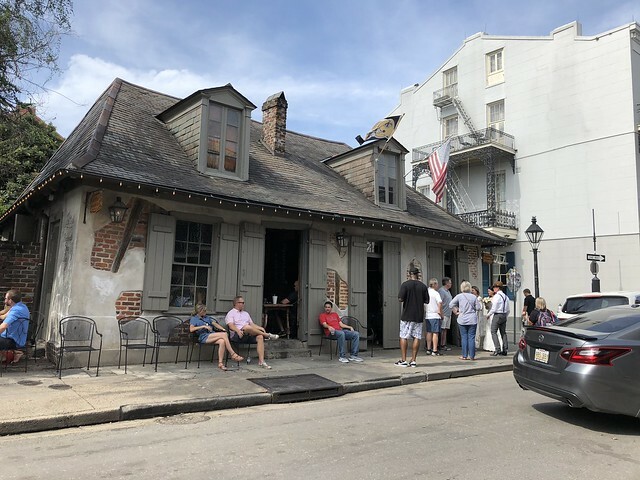 It is unlikely that a wealthy Creole would agree to meet at home on Royal Street. Bourbon and St. Phillip was probably regarded as a safe and convenient neutral ground. 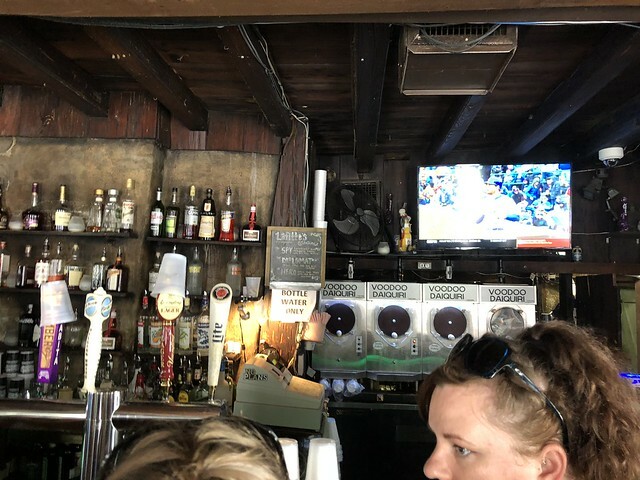 Like most New Orleans legends, Lafitte's Blacksmith Shop is a gumbo of truth and French, Spanish, African, Cajun and American embellishments. Strong, for certain. This place is historic and very cool. There are a lot of ghost stories about it, and it's a world-famous must-see. 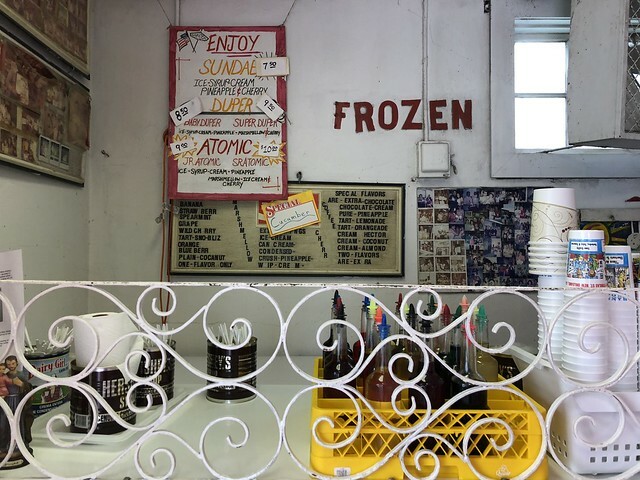 Old-school spots that thrive in communities are my favorite. 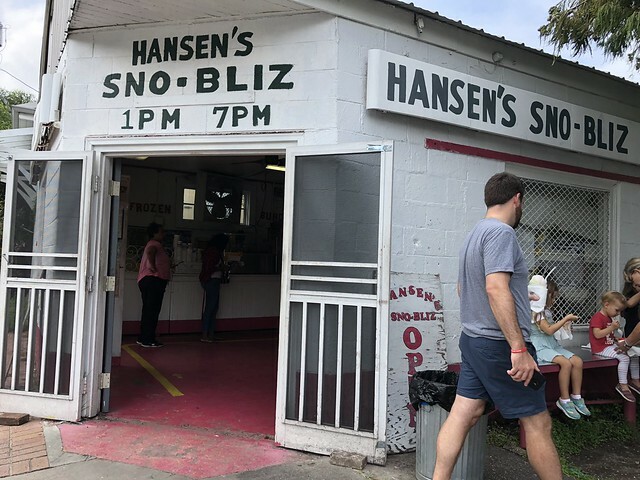 Take Hansen's Sno-Bliz. 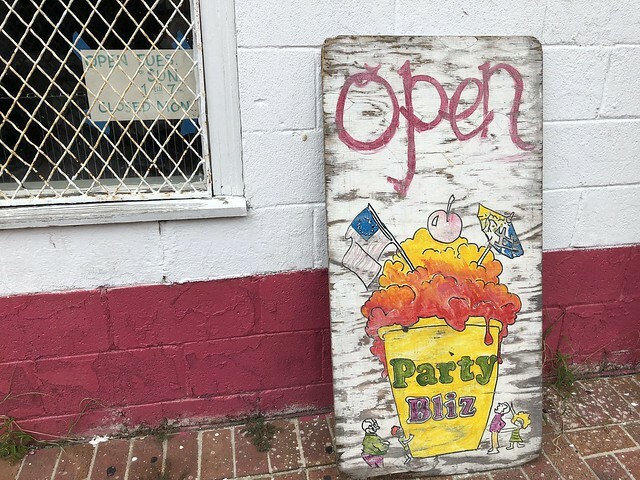 This icy dessert spot is in a white cinder block building, hand-drawn letting outside and has fans from all over. 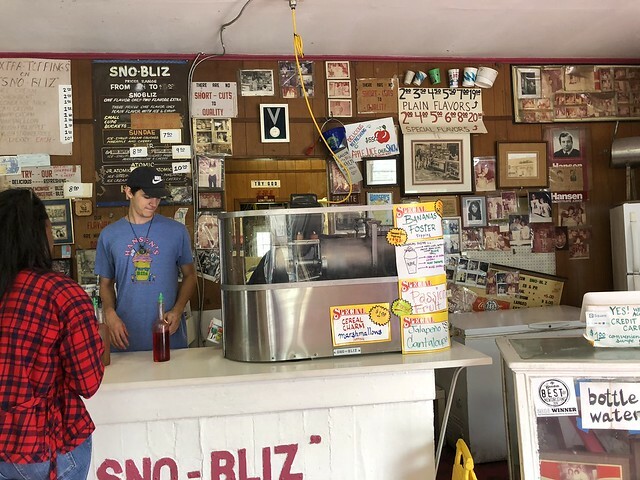 Hansen’s Sno-Bliz was started by Ernest and Mary Hansen in 1939. Ernest invented the first ice shaving machine and Mary created her own flavored syrups. 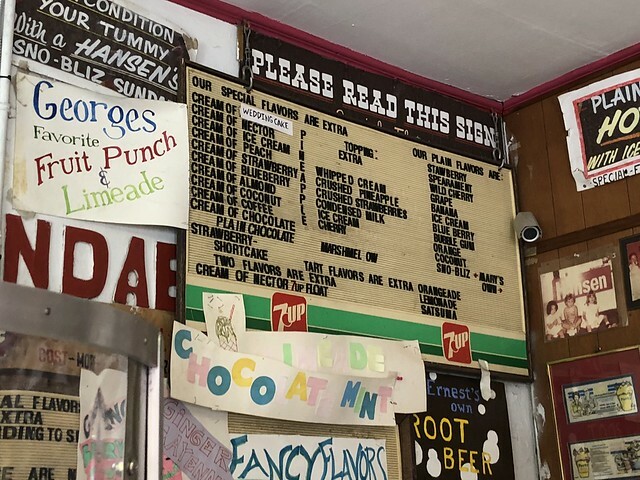 Hansen’s is now owned and operated by Ernest and Mary’s granddaughter, Ashley. We are proud to be named a 2014 American Classic by the James Beard Foundation. 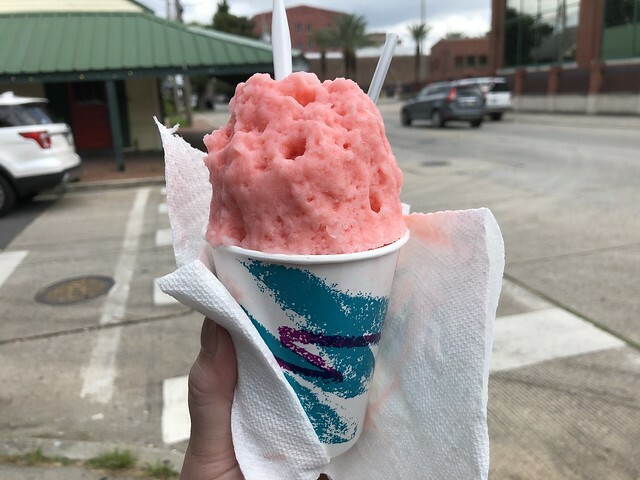 Sno-balls in Louisiana are similar to what the rest of the country calls snow cones, but they are made with more finely shaved ice and a large variety of homemade syrups. I went for a "Cream of Nectar" flavor. It was light and fresh and sweet and perfect for a warm day. 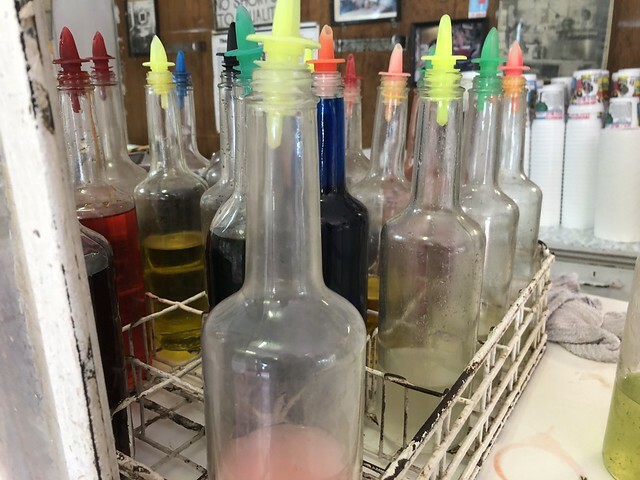 What's your favorite flavor here? 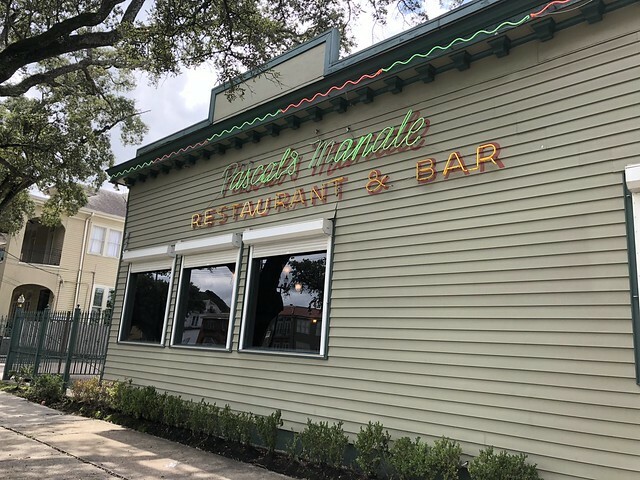 When searching for iconic restaurants in New Orleans, there were a few that kept coming up time and time again. 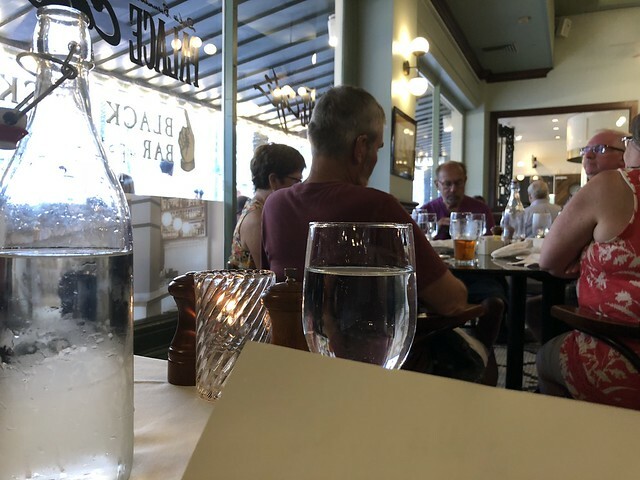 Of course, there were diners and fine dining and chocolatiers and more. One of those was Pascal's Manale. 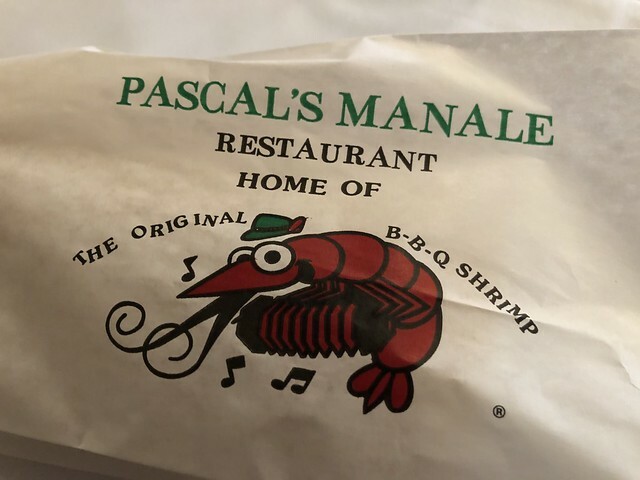 Pascal's Manale is known for BBQ shrimp, a messy experience you gotta have. 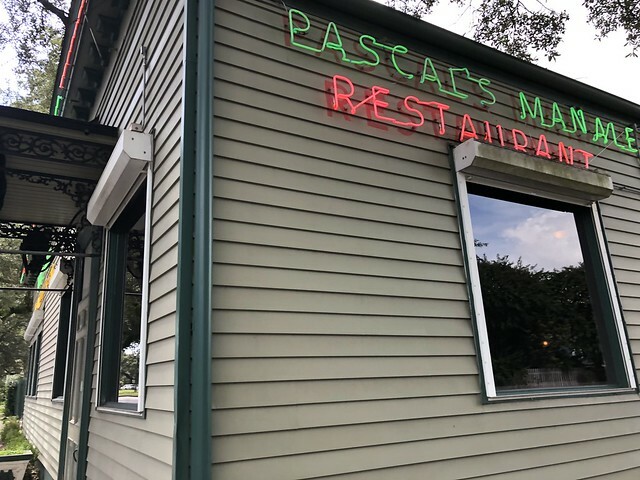 The 1950s brought the infamous BBQ Shrimp to Pascal’s Manales. 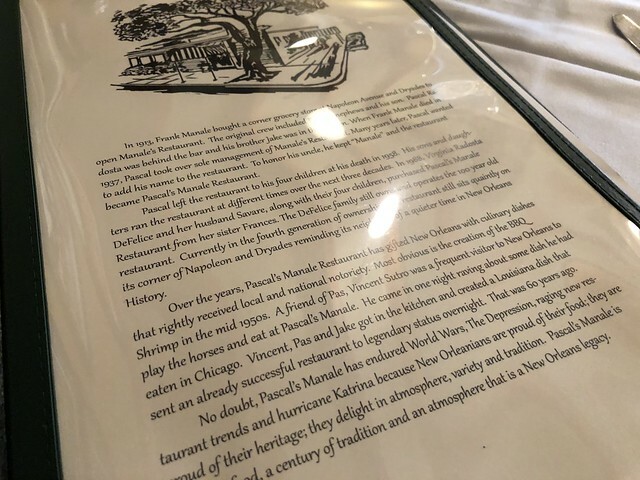 A good friend of then owner Pascal Radosta, Vincent Sutro was a frequent visitor to New Orleans to play the horses and eat at Pascal’s. 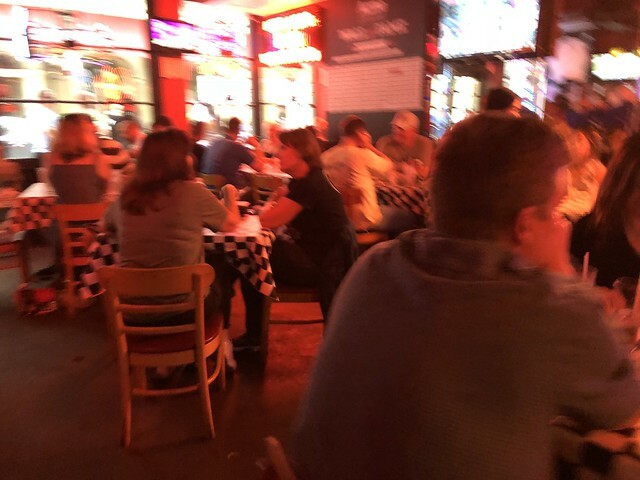 He came in one night raving about some dish he had eaten in Chicago. He explained it to Jake, Jake recreated this dish with his Louisiana spin and put it in front of Vincent to try. When asked if it was the same, Vincent said NO, it is better. 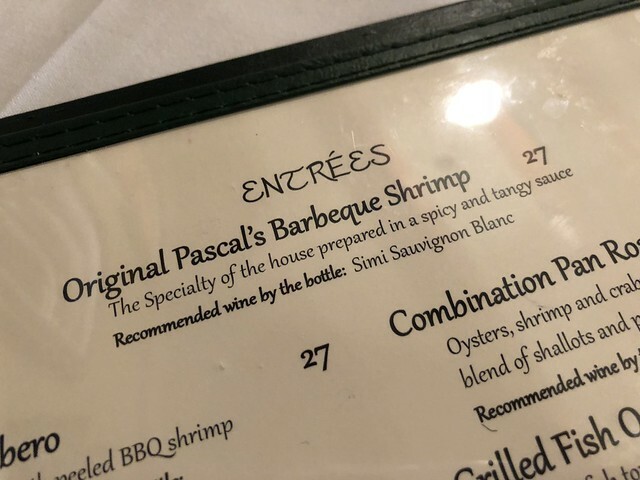 Pas loved it so much, he immediately put it on the menu. The rest is history! 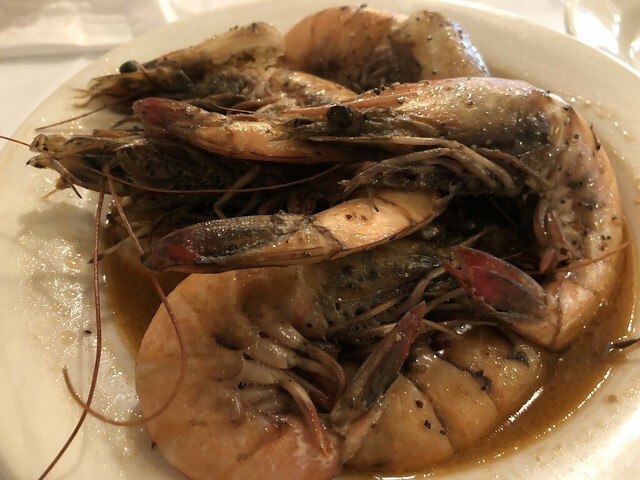 The BBQ Shrimp is the restaurants lasting contribution to local cuisine. It is this dish that has brought worldwide notoriety to the restaurant. It is this dish that tourist and locals alike pour in night after night to eat. 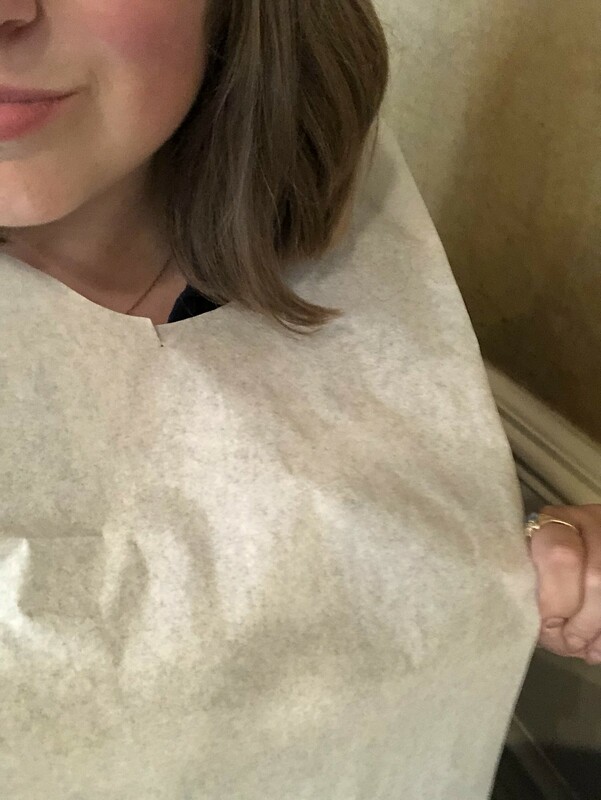 Clad with a bib, I was ready to try these BBQ shrimp. They come out whole - head and all - drenched in a thin, tangy sauce. 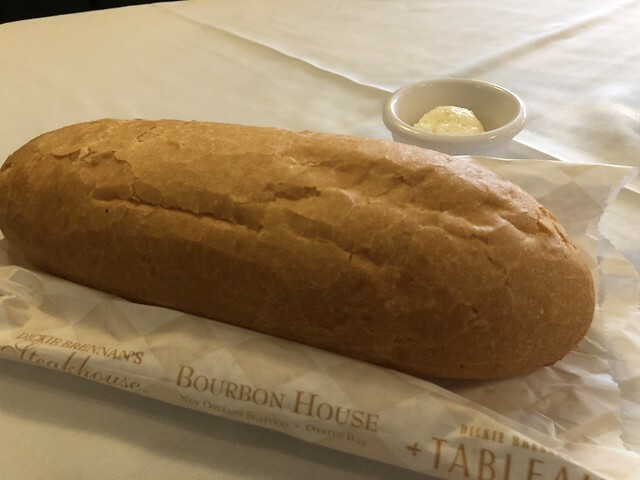 I came to realize New Orleans serves bread with literally every meal. But here, it was particularly great because it helped sop up all that tangy deliciousness. So, I had the waiter teach me how to eat these. He was very gracious. But, essentially, grab ahold of a set of the legs and rip them over to one side so you can peel the whole thing off. With any luck, the whole thing comes off in one go and the head is easy to pull off. They are tasty! I've never had shrimp like this, and it was a whole experience. The flavor of the shrimp really shines here, with the sauce only accenting it. 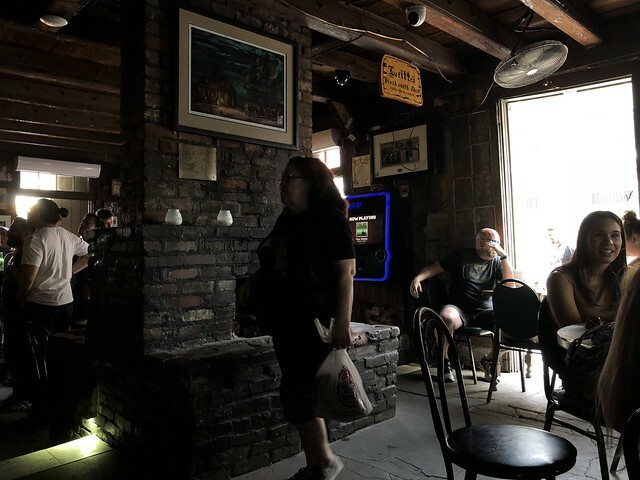 Moundsville Edition: Mason Dixon Barbecue Co.